Alright it’s already February (how’d that happen?) 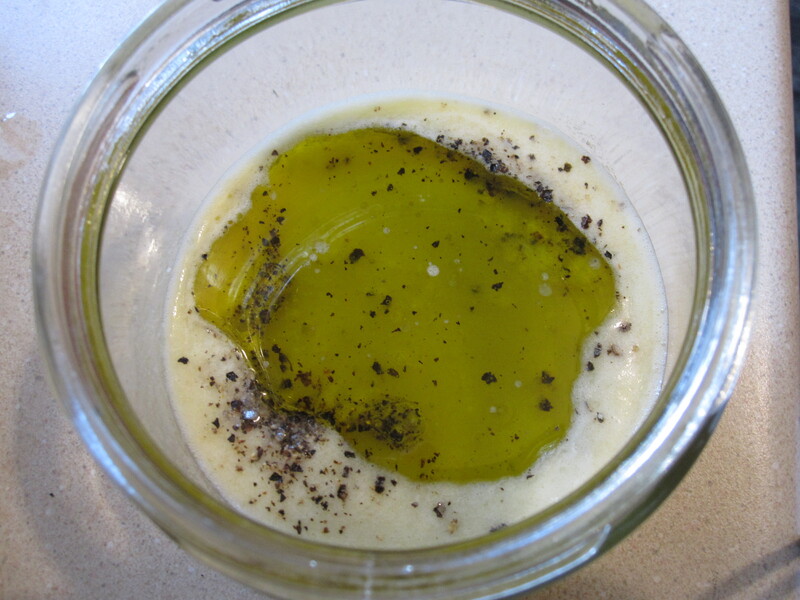 and I planned to post this as a healthy new-years resulotion-type recipe. Oh well, better late than never! 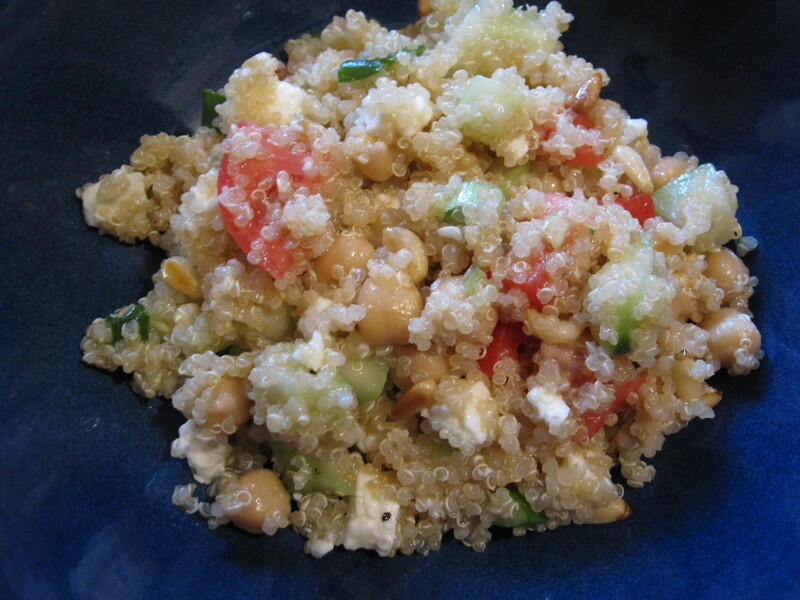 This is a nice, light and healthy recipe inspired by a Mediterranean cous-cous recipe my mom used to make. I started making it back in college and people seemed to really love it. 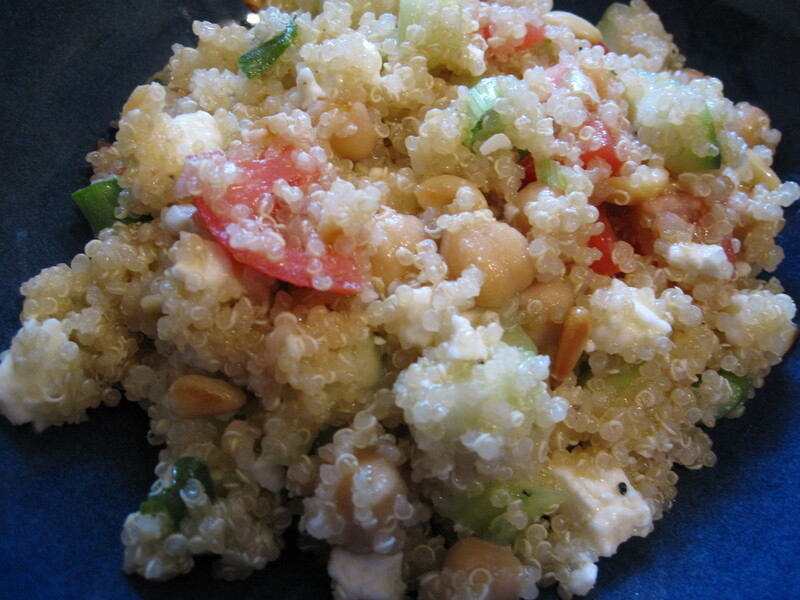 I used some of the same ingredients in this recipe and swapped quinoa for cous-cous for added nutrional benefits. I also added chickpeas (because I’m obsessed) and omitted arugla, which I think I will keep next time for some added greenery. Greenery is a word right? Alright, let’s talk about quinoa for a moment shall we? 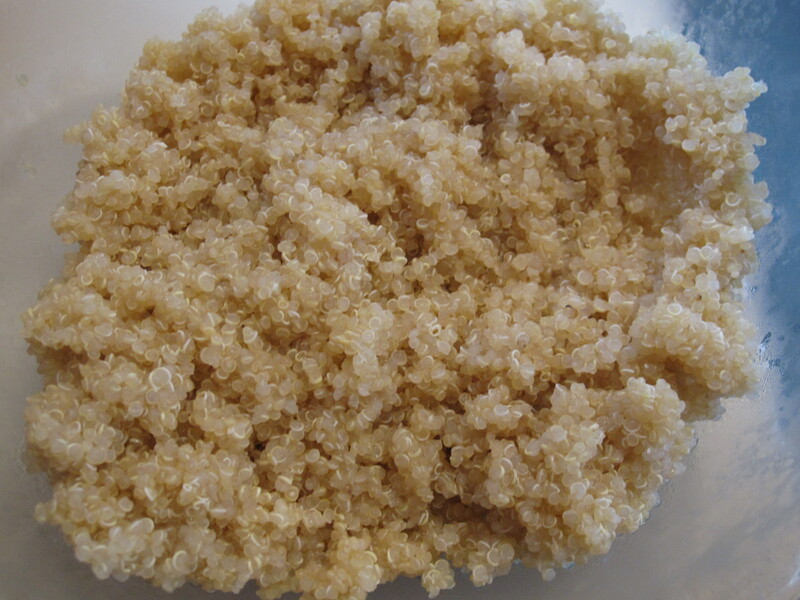 Quinoa cooks similarly to rice and you can actually make it in your rice maker if you’d like. I cook 1 part quinoa to two parts liquid, bring it to a boil. Lower to a simmer and cover for 12 minutes. Then fluff with a fork and it’s done. Once it’s cooked, set it aside and let it cool. Meanwhile you can prep your other ingredients. 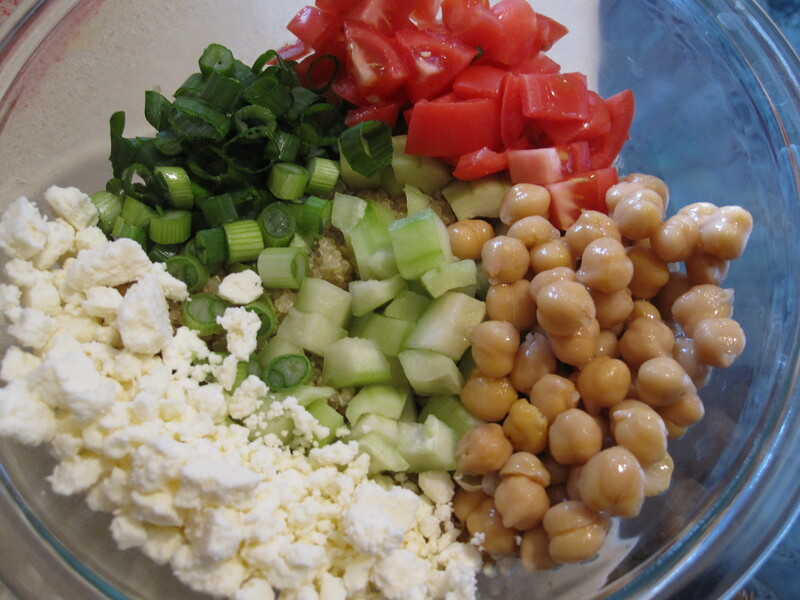 In the mix here: diced tomatoes (seeded), diced cucumbers (seeded), chopped green onions, chickpeas, and feta cheese. Oh, and don’t forget toasted pine nuts! These can be pretty expensive, but worth the splurge if you’re feelin’ it. Next, it’s time to make a lemon vinaigrette, by mixing fresh squeezed lemon juice, extra virgin olive oil and a good dose of salt and pepper. Stir and pour over the quinoa and veg. Mix well to combine and there you have it. Simple, fresh, delicious. 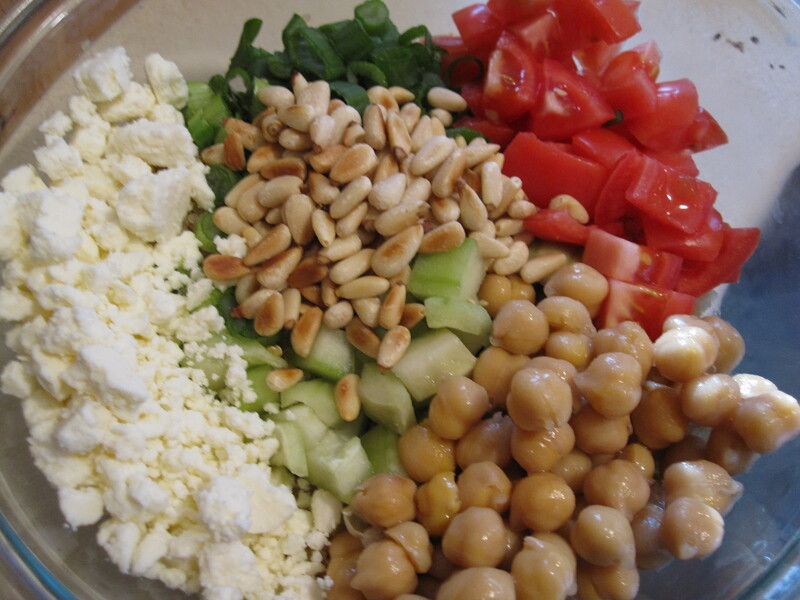 This entry was posted in Sides, Vegetarian and tagged chickpeas, feta, greek quinoa salad recipe, how to cook quinoa, lemon vinaigrette, pine nuts, quinoa recipe, side dish, vegetarian. Bookmark the permalink.